THIS VOLUME CONTAINS a broad review of recent scholarship on Saint Birgitca and the Birgittine Order. 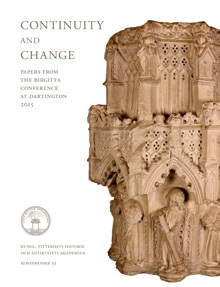 The twenty-three papers were originally presented at the third international Birgitca conference at Darcington Hall, Devon, in July 2015. The conference celebrated the sexcentenary of the foundation of Syon Abbey, and eleven of the twentythree papers focus on the English Birgittine house. The remarkable story of Syon's continuous existence prompted the conference's broader theme of continuity and change in the Birgitcine Order. Over the centuries, the order has seen many changes: periods of growth and decline, expansion and retrenchment, patronage and persecution. Are there any constants, something intangibly, indefinably Birgittine? Is Birgittine identity about adherence to an essence or ideal, or something chat is worked out in practice? The interdisciplinary conference gathered scholars specializing in various fields, including Archaeology, Art History, Literature, Musicology, and Philology. Edited by Elin Andersson, Claes Gejrot, E. A. Jones and Mia Akestam. The volume is a collection of 23 papers. For information on the authors, see the inside cover Aap.